You are here: Home » Announcing Retro Recipe Challenge #1! 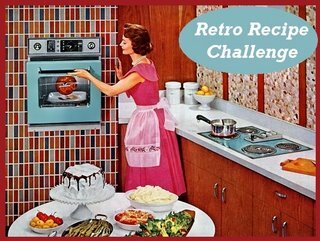 Announcing Retro Recipe Challenge #1! RRC #1 Challenge has been posted. Please take a look! One of my favorite sites is The Gallery of Regrettable Food. Such loving care seems to have been put into each recipe – but the results are just appalling. When did benedictish frankwiches seem like a good idea? Why? The point here is to find an old recipe and have fun creating it. When possible, cite your source, the year it was published, and take photos! (Here’s an example.) Post your results on your blog and then send me the link between now and June 9. I’ll post the round up shortly thereafter. I’ve also had luck doing Google search for “Recipes” plus the decade (e.g., Recipes 1930) . Don’t forget to peruse your local library, scour some garage sales (I found a 1960’s cookbook published by the Alabama Peanut Producers Association…), and dig through your Mom’s or Grandma’s (or Dad or Grandpa’s) bookshelf. Let’s party like it’s 1955 – get cooking! Great challenge, Laura Rebecca!Count me in! Ivonne, seriously: God bless you. I was/am worried that no one will participate.But if it’s just you and me, we can throw on our pearls and high heels, eat our gelatinous salads, and drink one too many Mai Tais. This sounds like fun! Unless there is a catastrophe, I’d love to participate.